Holy Cow! 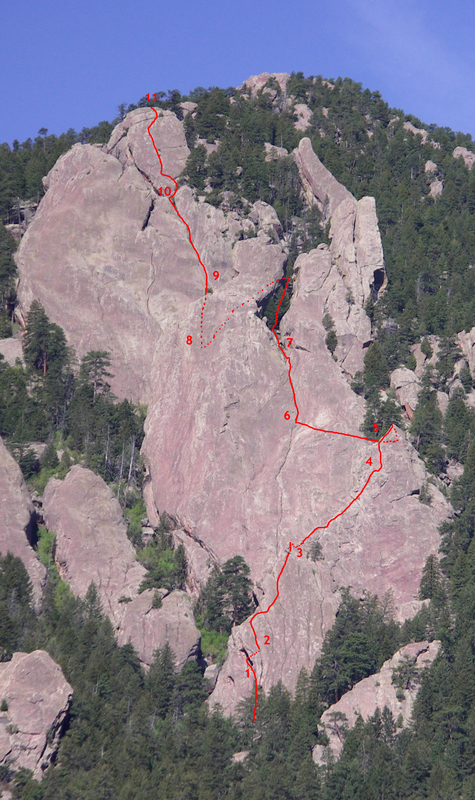 How long has it been since I did the complete 4th Flatiron east face. 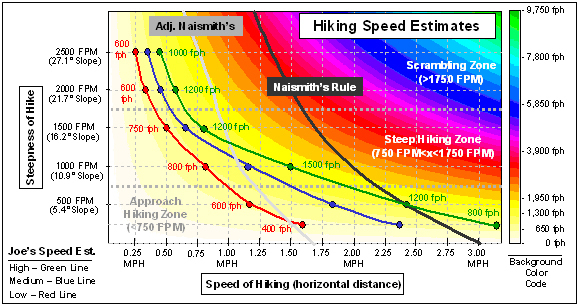 I could barely remember the 3rd piece of rock and I couldn’t find any record of an ascent since 1998. Now, it couldn’t have been that long, but I’ll bet its been at least 10 years. I am learning to hate how time slips by. If you’ve been paying attention, you’d know that Brian and I failed on an attempt on the 4th earlier this year (see 4th Flatiron Slowfest). Now, climbing the 4th in March is plain crazy, but in January is flat out stupid; let’s just say I didn’t feel too badly about not finishing on the earlier effort. But now, since the weather has been in the 70’s for 2 weeks and the snow is essentially gone, we had to finish it. We just had to. 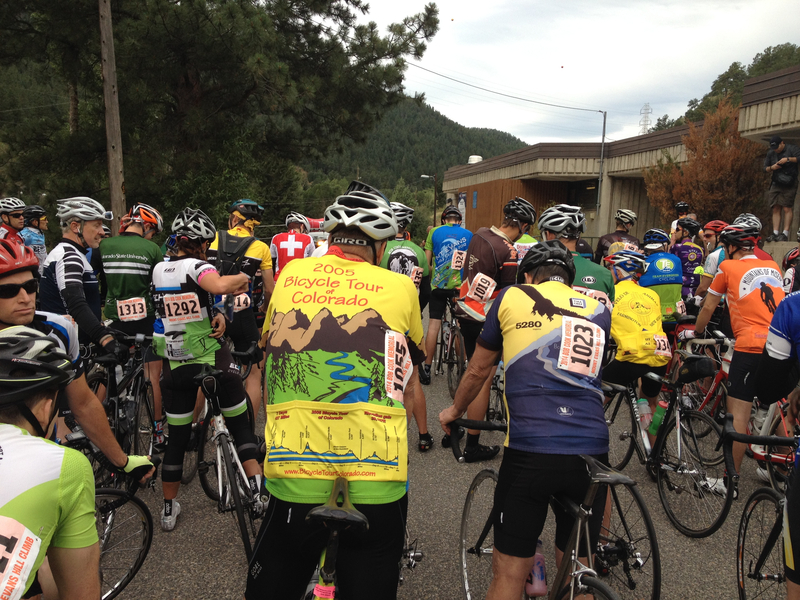 We started up at 8am, which was strange since that was the plan (I was on time). 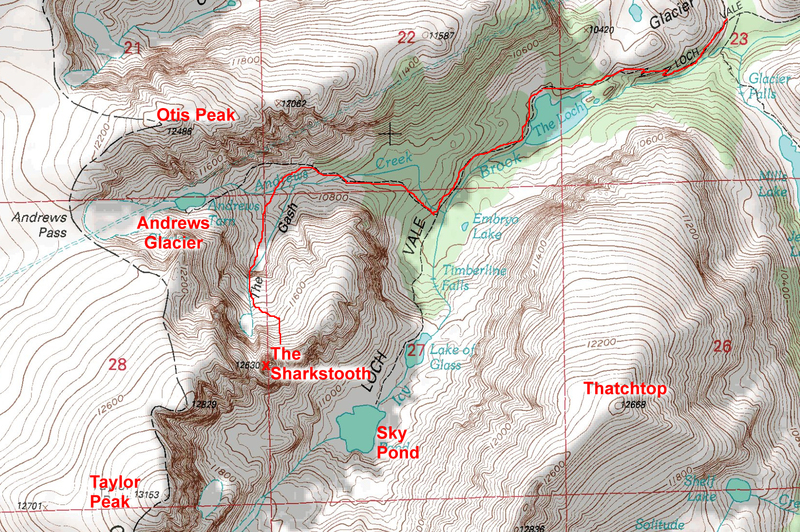 We hiked up the trail at a brisk pace and made ready to climb at the base of the 4th by 9am. Brian announced that he’d like to do the ‘chimney pitch’ which required me to take the first pitch. I accepted. 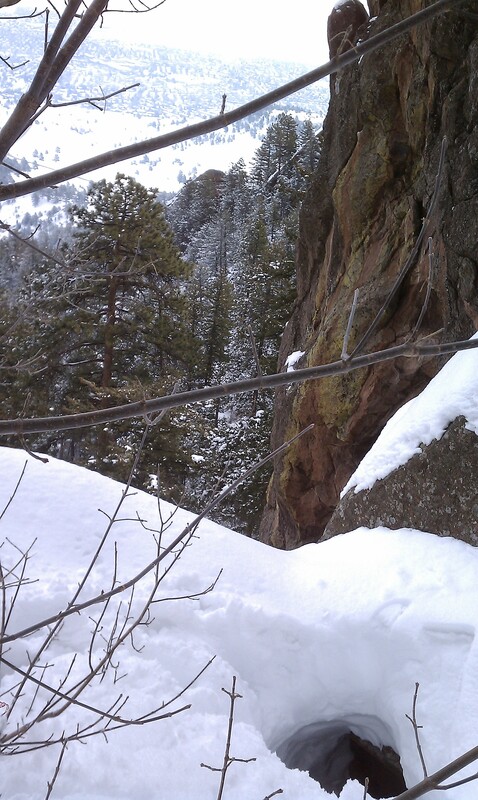 I scrambled up the 1st pitch, which is only 75 feet long to a nice ledge. I remembered to bring my rock shoes, and I enjoyed the security at every step. 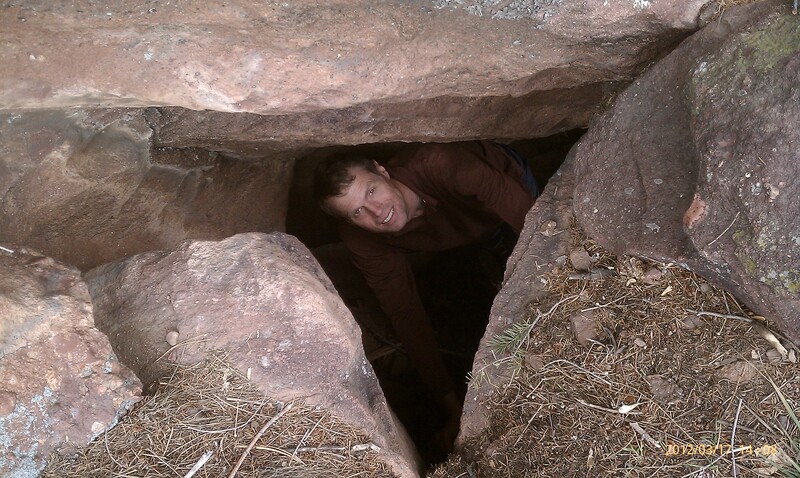 Brian took off toward the cave with a grim determination to crawl out the hole in the top. He pulled through and setup an awkward belay to bring me up. 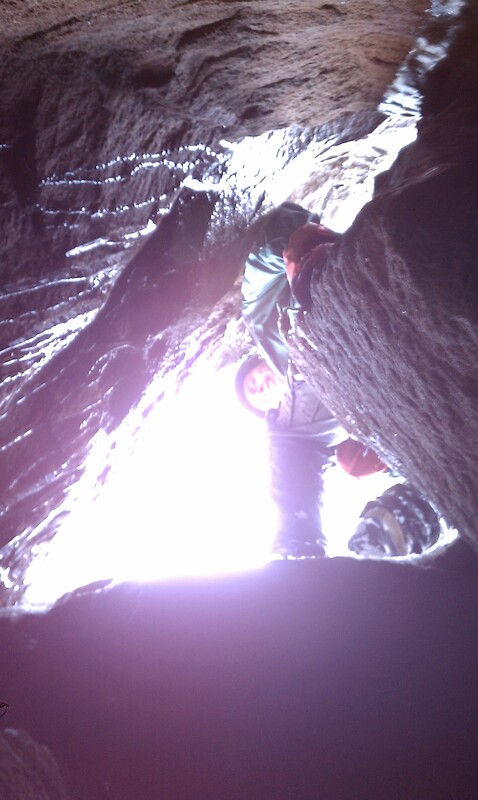 I scrambled up to the opening of the cave, handed up the packs, and then barely fit through. And, I mean barely. It was a near thing, and I nearly had my harness pulled off as I ssssqqqqquuuuueeeeezzzzeeeeddddd through. I most certainly would not have fit through 20 lbs ago. I stretched out the 200 foot rope to make a nice ledge. I even got in a few pieces of pro. Brian took the entire rope length to reach the only nice ledge in the vicinity. 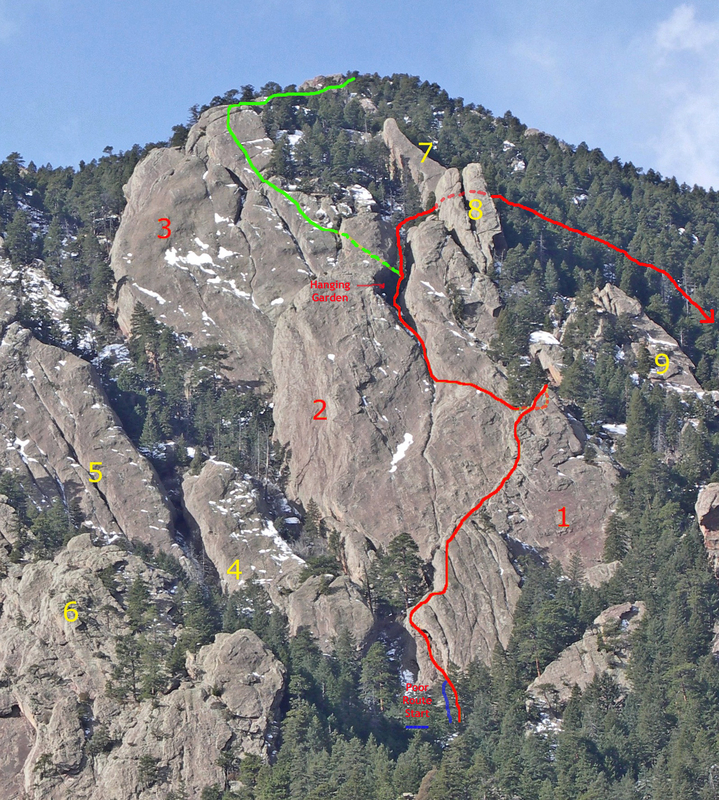 I took the finish to the 1st piece and continued on to the start of the next pitch on the 2nd piece of the flatiron. We stopped for a brief snack at approximately 11am. 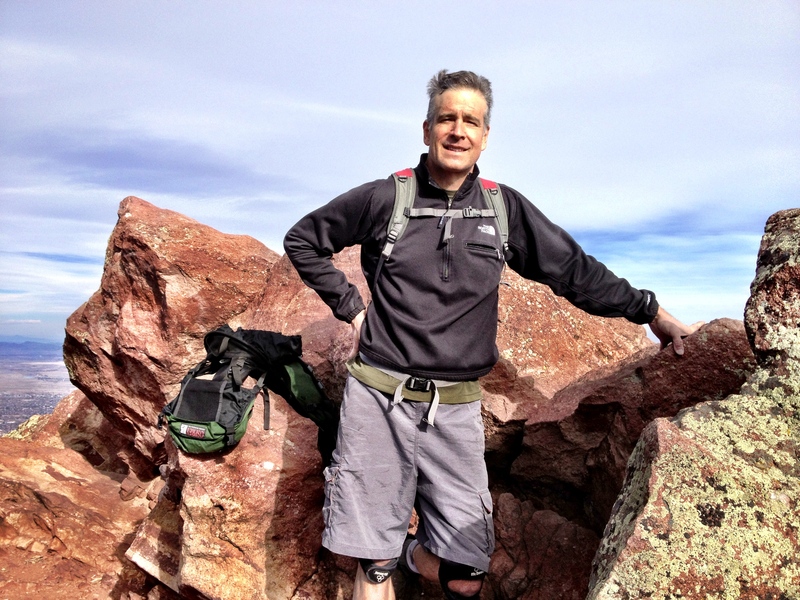 We paused long enough to fully appreciate what a beautiful day we had to enjoy….and once again appreciate how lucky we are to live in Colorado. 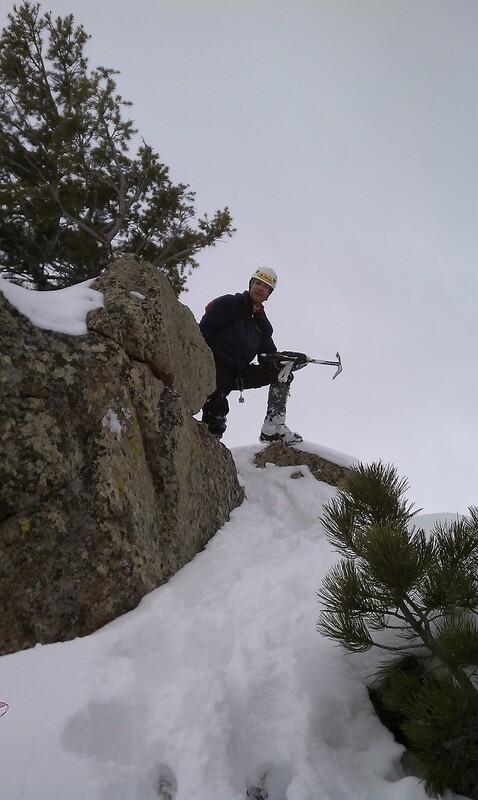 Brian took the sharp end into the gully and stopped quickly after finding a good belay spot. He had learned a hard lesson the last time, when he couldn’t find a belay and had to simulclimb over terribly exposed and slippery rock to reach the hanging garden. I didn’t blame him one bit. I could not find much pro along this entire stretch that nearly reached to the Hanging Garden. It was a bit unnerving. I was forced to setup a belay in a a sea of thorn bushes. I got a hundred tiny thorns imbedded in my flesh for my trouble. I also froze to death as the wind picked up in the natural wind tunnel. I luckily remembered to bring a jacket, which I wore for the rest of the day. Brian finished the scramble to the garden and then we walked to the backend of the garden…. 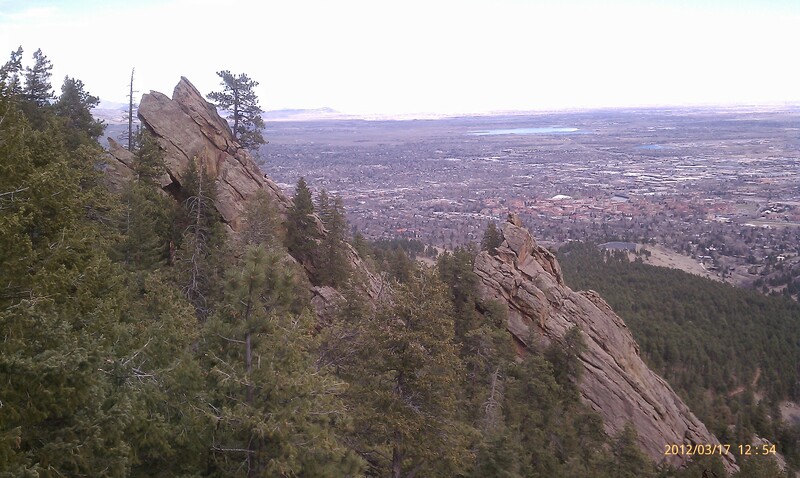 and then out to the 3rd and final piece of the 4th Flatiron. Unfortunately, neither of us could remember how to finish this damned route. 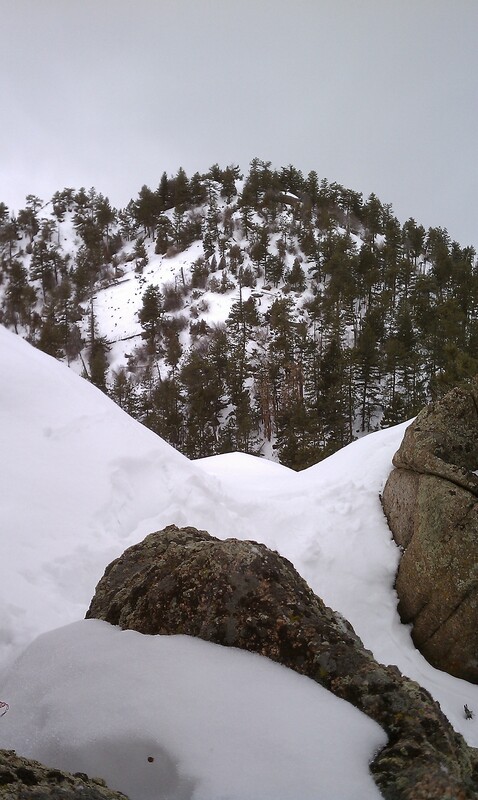 I remembered descending a bit and then taking a right curving line to get back into the big gully. Brian remembered nothing. 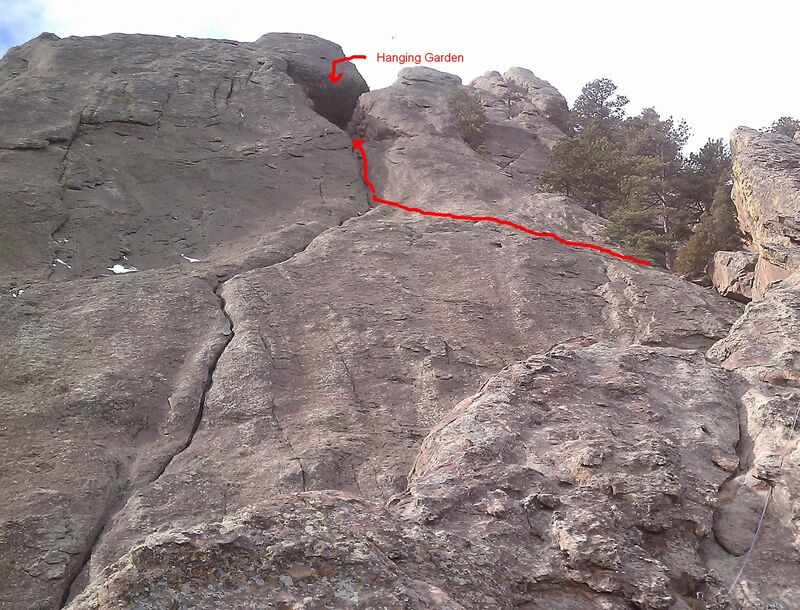 Note: I read later that the ‘official’ route is to walk directly across from the Hanging Garden and head up and left. I’ll try to remember that. But Brian doesn’t scare off; he accepted the challenge and took off. 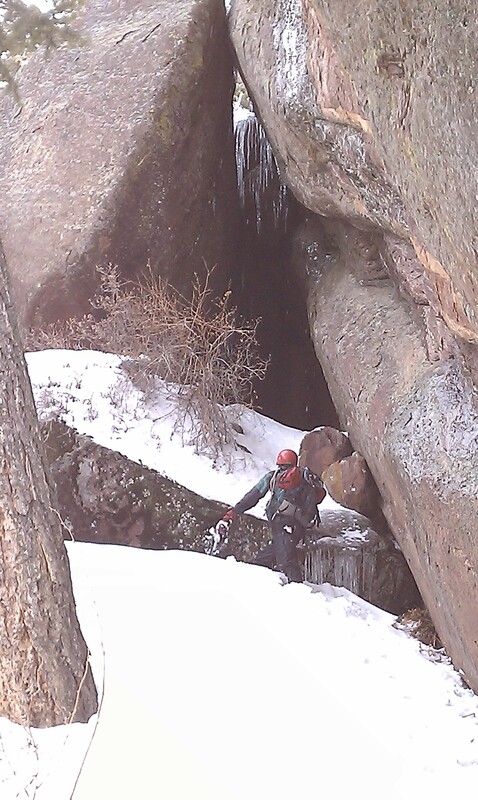 He didn’t get any pro for a while, but eventually made it to the base of the wide portion of the big gully. This was hard, for a mere 5.4 route. Water polished rock with no pro. I didn’t let myself think about it too much and just kept moving up. Eventually I did start finding pro, but the slick difficulty did not relent until I reached a nice ledge below the exit to the final crack. A part of the problem was the wet mess leftover from the snowpack in the center of the gully where otherwise there might be better footing. Brian flew up the final pitch. 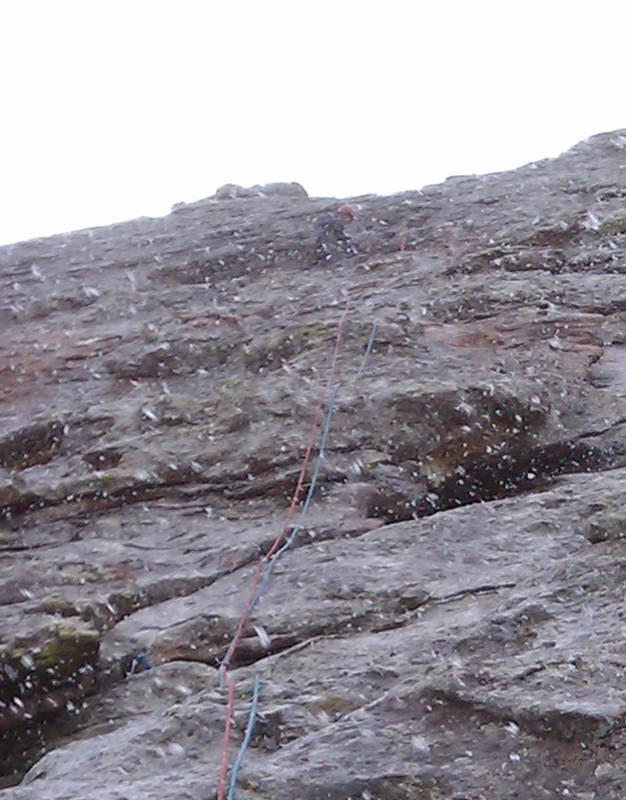 I remembered thinking that this was the crux pitch on previous climbs, but not this time. It was 3rd hardest, at most. We arrived at 3pm. The descent off the overhanging ledge is always tricky. I didn’t hesitate this time and just downclimnbed until I could jump. Brian remarked, “always anticlimactic”. I responded, “it felt climactic to me”. It really did. Be ready. 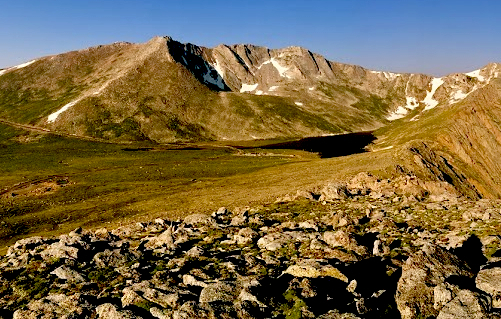 We then followed our line from our earlier Tangen Tunnel climb (see Winter Tangen Tunnel), staying on the ridge line as we climbed and passed a series of ribs to reach the descent trail from Green mountain. At 5pm, we arrived at the parking lot. I was surprised that we managed to do a 9-hour day without much difficulty. Not too old, I guess. 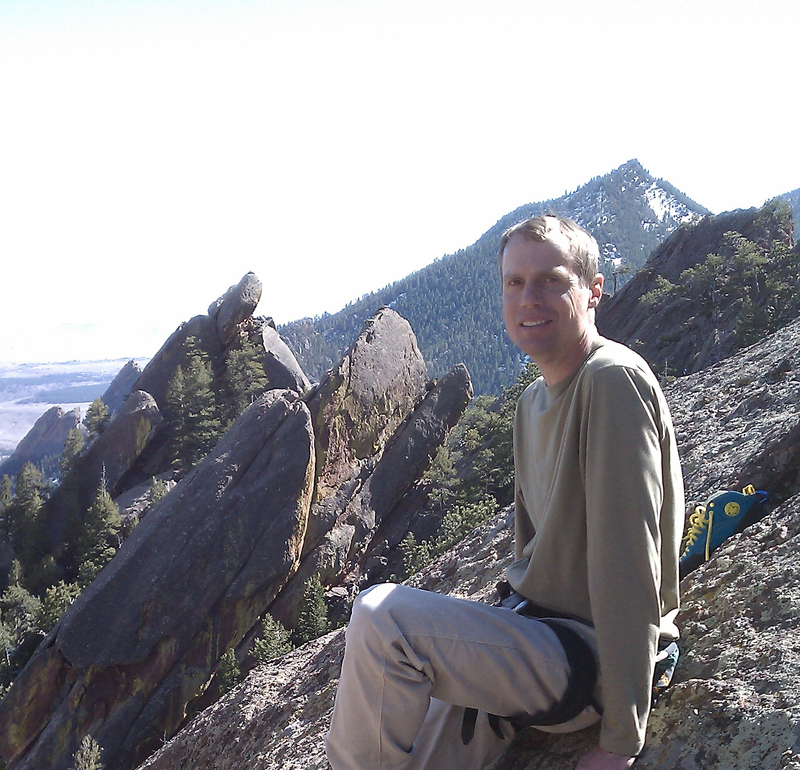 On January 21, 2012, Brian and I chose to take advantage of an amazingly warm late January saturday by climbing the 4th Flatiron. While the mountain snowbase has recovered sufficiently to begin the ski season (just barely), circumstances beyond our control precluded that alternative. 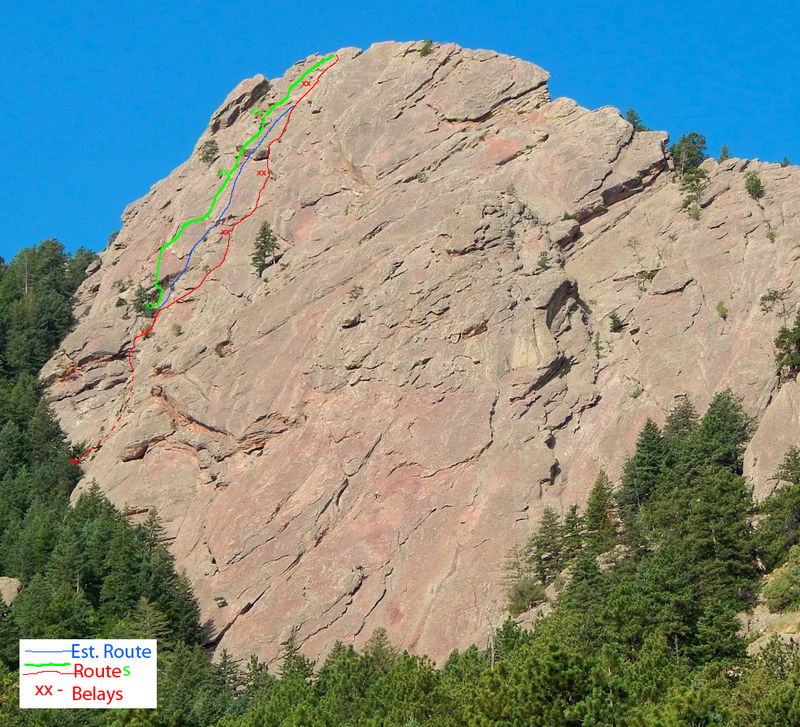 Besides, I like climbing the Flatirons, and the 4th Flatiron with a finish over the top to the summit of Green Mountain is a favorite not done for 4-5 years. 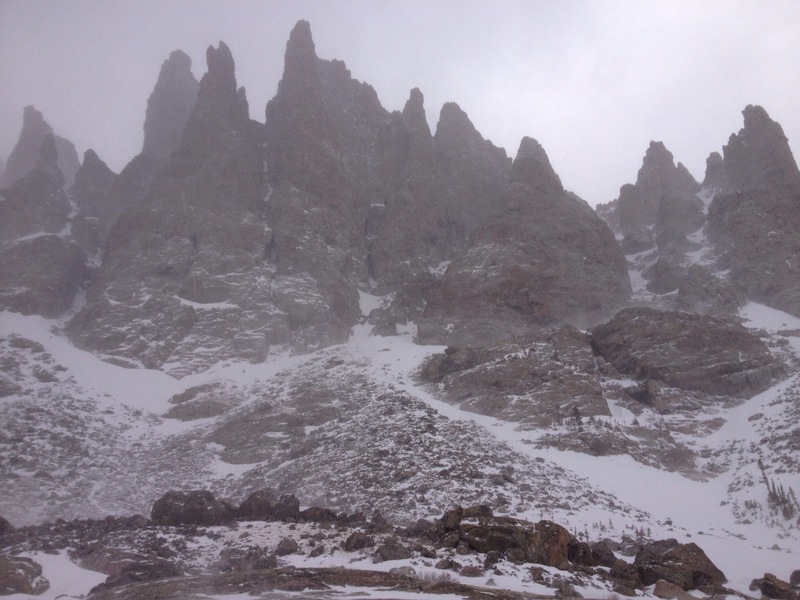 It had been warm long enough since the last snow fall that we simply assumed the conditions would be fine; we should have known better, especially on the 4th Flatiron East Face route (which could have been named, ‘the east face gully route’). 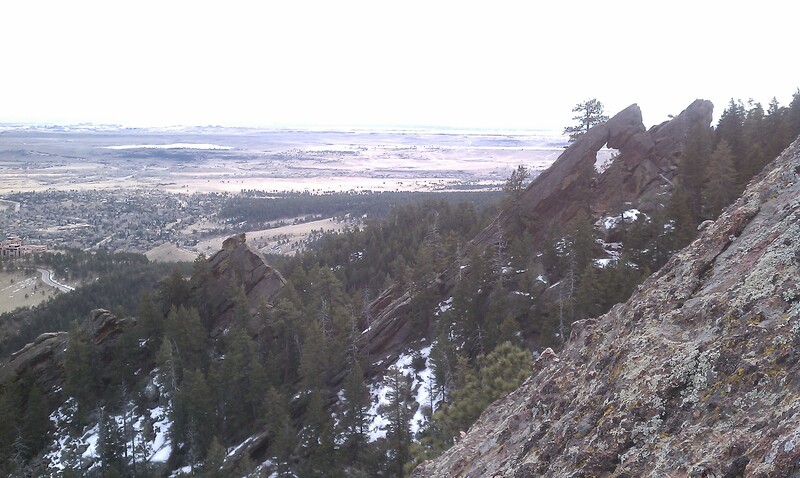 We started from the Chautauqua parking lot at 8:30am and hustled up the road toward the 4th Flatiron, enjoying our sunny, 30F morning. The temperature forecast was for a high of 61F much later in the day, but we had some sort of Chinook where the higher we got the warmer the breeze became. 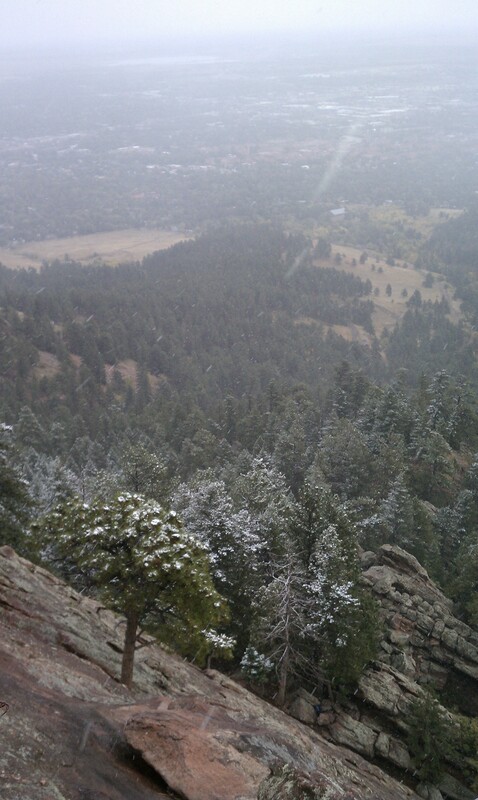 About 1/2 way up, I had to stop to take off my jacket; I hiked the rest of the way in my t-shirt. Chinook: A type of foehn wind. 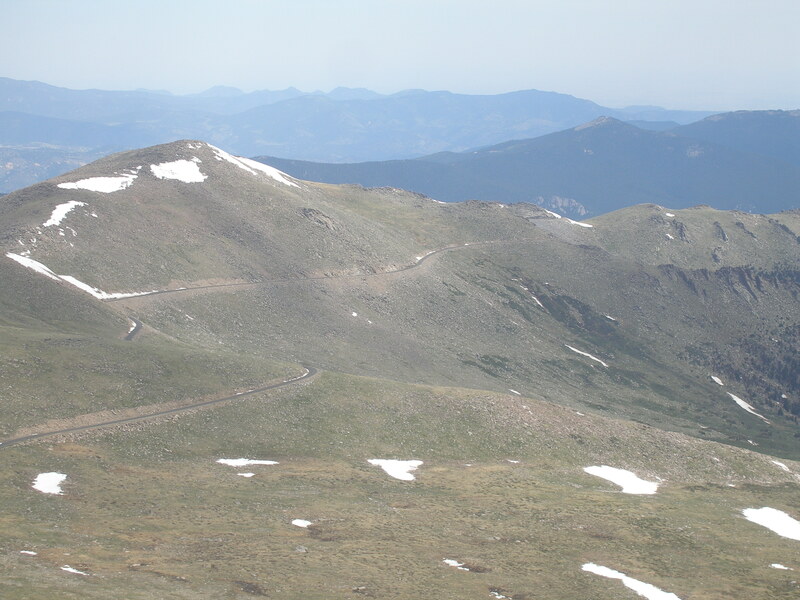 Refers to the warm downslope wind in the Rocky Mountains that may occur after an intense cold spell when the temperature could rise by 20 to 40 degrees Fahrenheit in a matter of minutes. Also known as the Snow Eater. 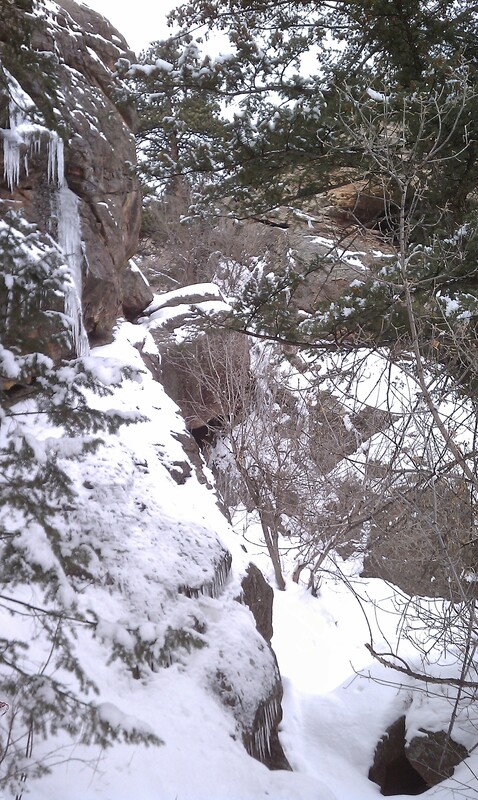 At the bottom of the route, we found snow covering the base of the climb. 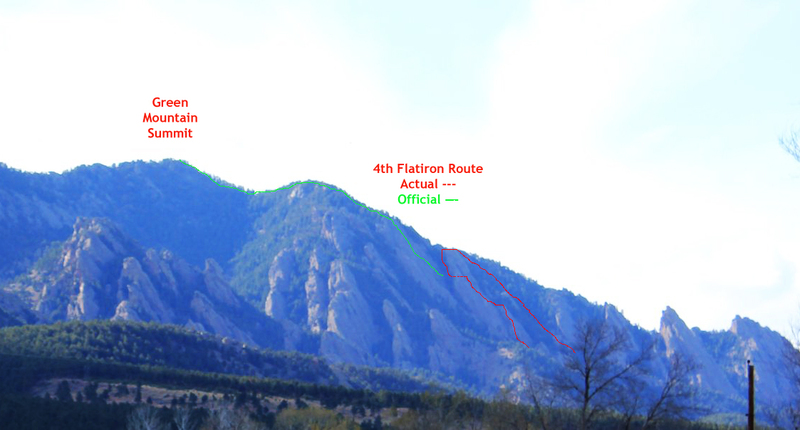 But the bottom pitch on the 4th Flatiron is such a non-event, even though protection-less, that we didn’t even discuss it. I asked Brian if he wanted me to take the first lead, since it was such a short, easy pitch. He hesitated to accept my offer since he likes to start fast, but after a few moments consideration he decided to let me take it so he could do the more interesting 2nd pitch. He handed me the gear and I took off. 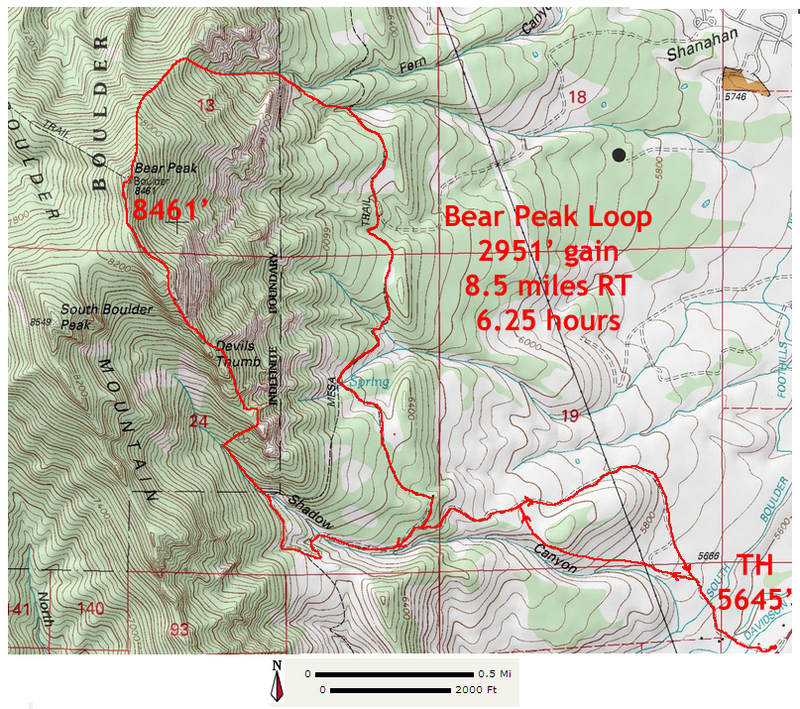 With a plan to head up to the summit of Green Mountain afterward, I was wearing my approach shoes instead of climbing shoes so that I didn’t have to carry 2 pairs. To keep them dry, I chose to start up a snow-less, shallow gully 10 feet left of the normal start. I didn’t think about it much but figured I could traverse over after climbing up a few feet. 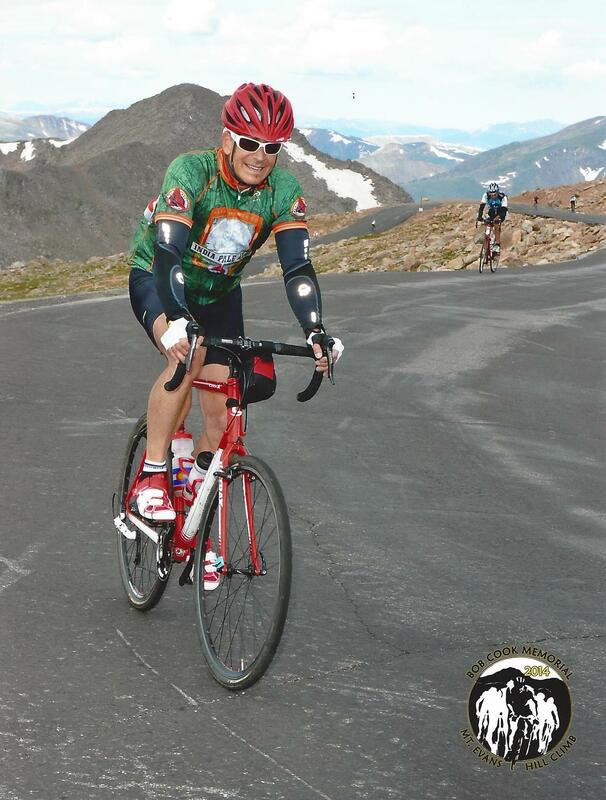 I was so unconcerned about the climb that I didn’t even bother to remove my liner gloves. And, for the first couple minutes, I climbed while finishing a work story that I had been telling Brian for the past 15 minutes. Normal Start (left) vs. 'Dry' Start Taken (right). 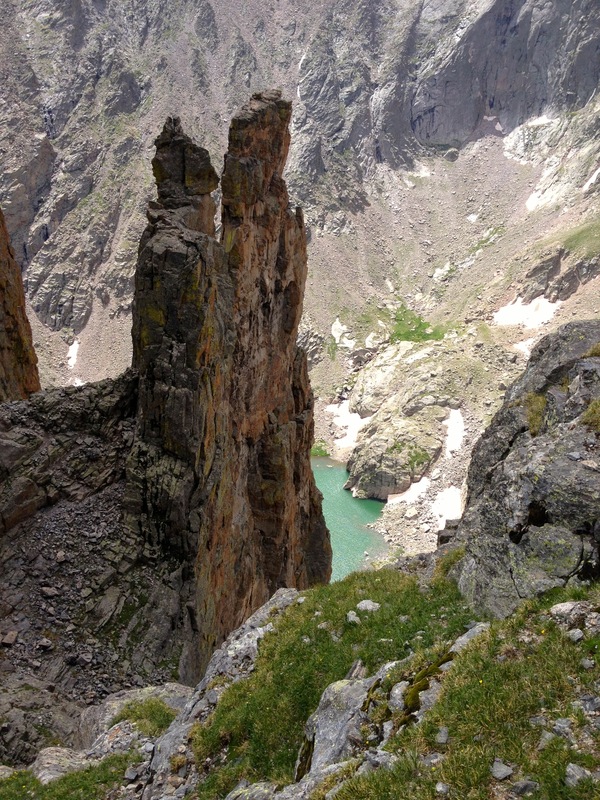 Photo taken on rappel. Suddenly it occurred to me that I had forgotten to do the traverse. 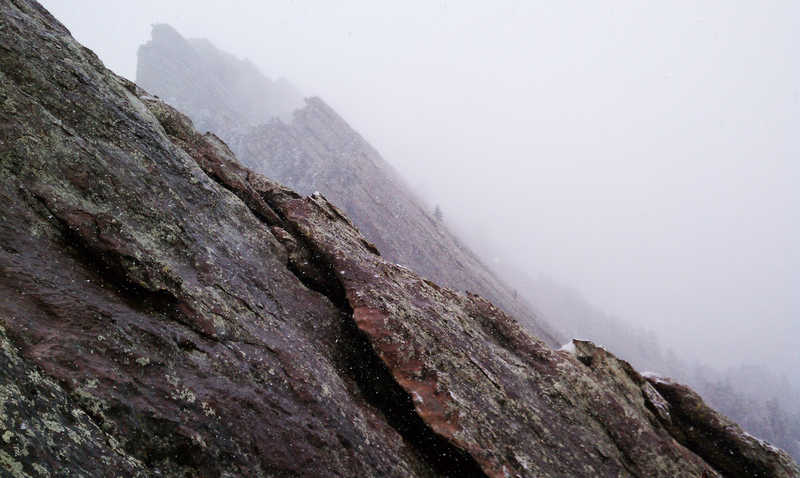 Instead of quickly getting onto easy ground, the climbing was getting steep and wet (from snow melt above). 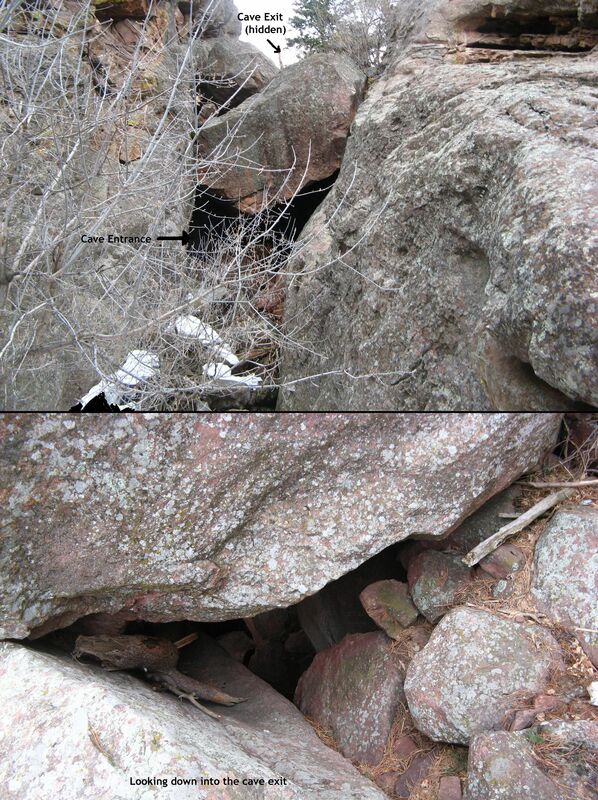 I looked across to the proper gully and saw that the intervening rock was too steep to traverse in my approach shoes. 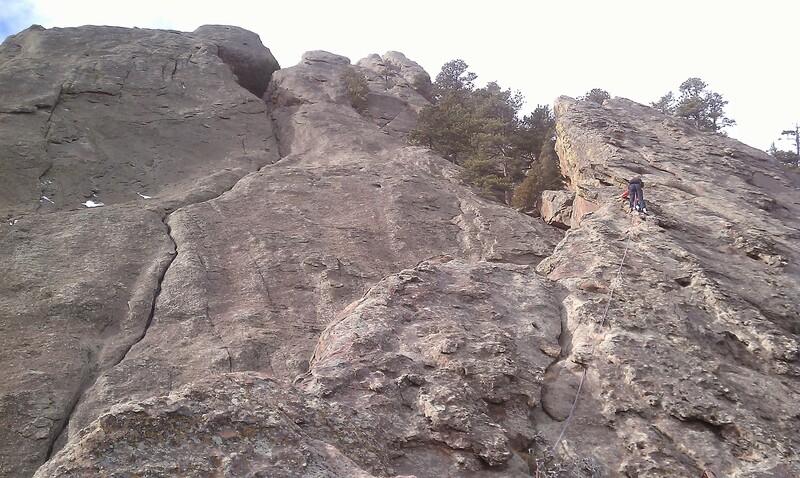 My only options were to continue up and hope for the best or down climb to a better spot for a traverse. Since I didn’t have any protection in the rock and it didn’t look like I would find anything for another 25′, I decided to attempt the dreaded and always difficult down climb. 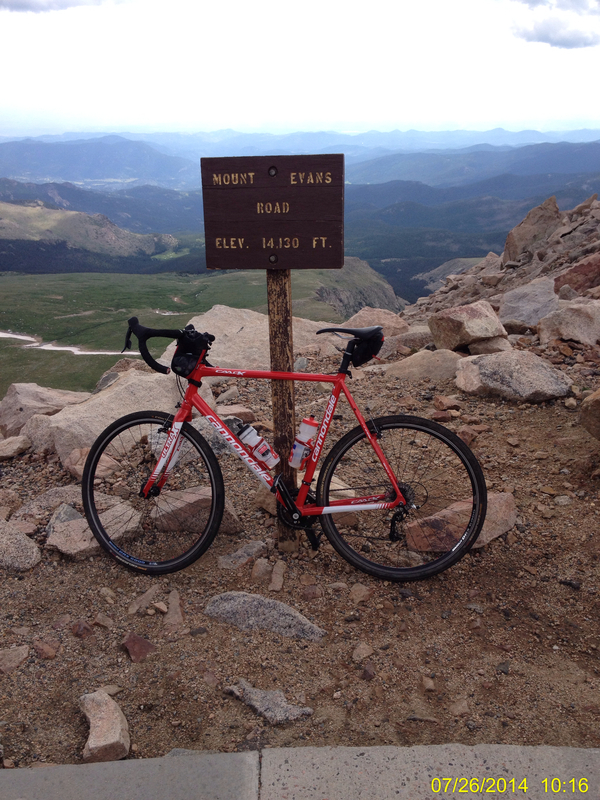 I managed to descend about 7′ but could go no further without a high chance of falling. I decided to try the traverse, but couldn’t figure out how to make it work. It just seemed too likely that I would end up sliding (or bouncing?) 10′ down the rock to the ground. 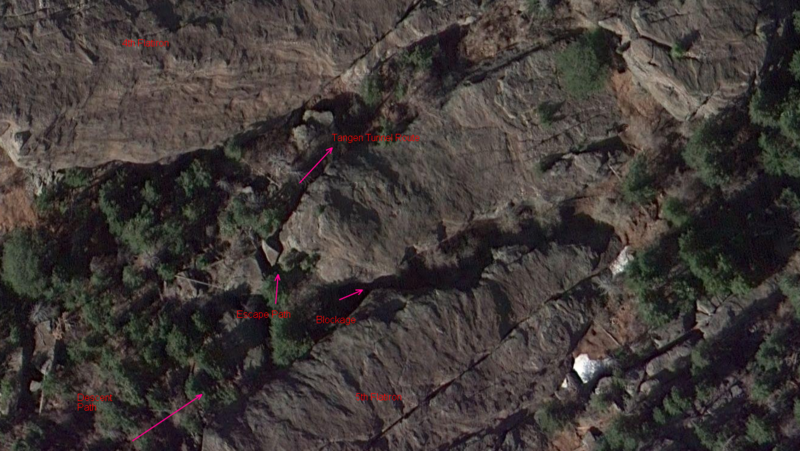 I looked back up the line I was on and could see that the holds got better as the rock got steeper. I didn’t want to take a chance on falling just yet and so I figured my best bet was to climb up and hope to find a way out of my jamb. Delayed Risk Preference Fallacy: the tendency to prefer solutions that eliminate a perceived likelihood of a bad outcome now in exchange for a likely worse outcome later. This tendency is related to Wishful Thinking (making decisions based on what is pleasing to imagine instead of by appealing to evidence, rationality or reality) and Irrational Escalation (justifying an increased investment in a decision, based on the cumulative prior investment, despite new evidence suggesting that the decision was probably wrong. )…this tendency leads to the pattern of behavior so commonly referred to as “it isn’t the crime, it’s the cover-up” made notorious by Watergate. Let me stop here and point out to myself and the world that this decision was horrendous. It goes against everything I have learned over the last 15 years. And this fact reveals just how treacherous the slippery slope of delayed risk preference is to human nature. Clearly the primary mistake was not paying attention to the need to traverse. But, once I realized that I couldn’t traverse without serious risk, I should have downclimbed as far as I could…even if I would eventually slip and fall to the ground. It would only have been a 7′ fall. But instead, I decided to continue up a path that was steep, wet, snow covered, never climbed (loose rock and a ton of lichen & moss), and with no chance for protection until after a fall would be fatal. By not wanting to face the serious but non life-threatening consequences of my initial mistake, I forced a bad situation and created a strong opportunity to die that I only survived by luck. I even said out loud after giving up on the traverse that I sure did screw up. Brian shouted up that if I was really worried, I’d take off my gloves. Right. Where was my head? I finally removed my gloves after reaching a set of bomber footholds and then continued up, one agonizingly slow move after another. I was able to reach the bottom of the snow cover without too much difficulty, but that ended any easy moves. I tried to dig out the snow and ice to find a crack for a cam, but the ice was too strong and went too deep. In the few minutes I invested in the effort, I only managed to tire myself out. About 10 feet into the first pitch, I woke up and started paying attention to the rock. I think Joe did, too, at that point, which was unfortunate for him because he was leading while I was just holding a useless rope. I watched him try once or twice, then abandon traversing right to the standard groove. The face he was on had just a hint of northern exposure and the accompanying lichen. But it was dry and the slope seemed to level off just above. Another 10 feet, still no pro, and chunks of snow start getting tossed down. Lots of snow. Where is he getting all that from? At least it is adding to the crusty drift at the base, which is Joe’s sole protection if he slips. I guess I’ll drop the rope in that case and try to “spot” him into the drift. 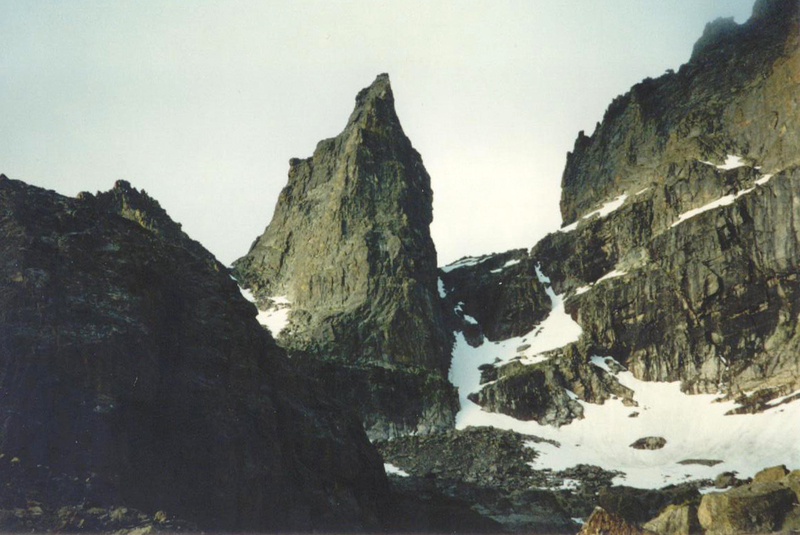 I looked up to see that the rock above steeped significantly and the improved holds which tempted me from below were now clearly wet. 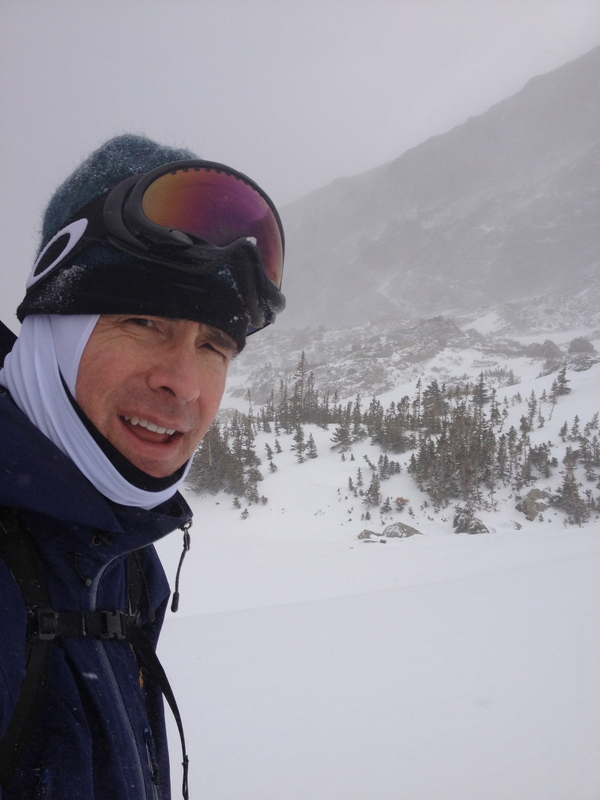 And, I could see for certain that there was absolutely zero protection until I reached the top of the snow cover where a large boulder was wedged. At this point, a sense of doom came over me. In my mind’s eye, and for the first time in my climbing life, I could foresee my failure and my body bouncing down the rock to my death. I would have given anything to be out of that situation, but there would be no rescue. Lacking alternatives to merely jumping to get it over with, I kept moving up. Despite not have any issues with my approach shoes, I had to continue to bear in mind that I wasn’t wearing rock shoes that would give me enough sensitivity to the rock to feel the beginning of a slip. I had to rely on my handholds to give me a 2nd chance if I had a slip; this caused me to grip extra hard and my fingers to get cold even faster than normal. And, the increasing lack of finger sensitivity forced me to grip even harder. I had to continue moving up by smearing the wet rock and could only stop to look around once more when I found two good footholds together. Slowly I crept toward the large boulder at the top of the snow cover and marking the easing of the rock angle (and protection, I hoped). Two more moves, and then only one more move to reach it. I was desperate to reach a bomber hold to save me…to let me recover. 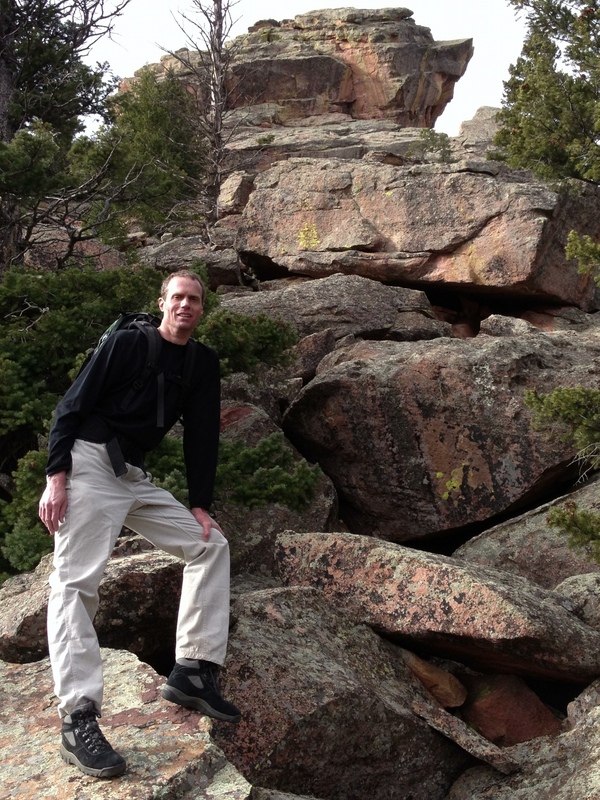 Finally, I was there and I jammed my hand into the crack between the boulder and the rock face….but no joy. 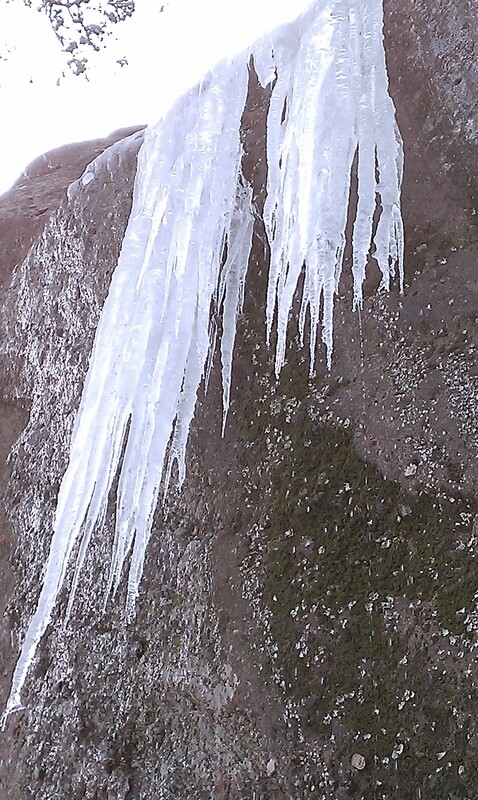 The shadows contained only icy, sloping spaces. Tenuously perched upon cramping legs on one good but wet foothold and one poor foothold, I had only moments left to save myself. I decided to place some rock gear in the icy shadows, hoping that something would catch somewhere, somehow. That done, I noticed a small detached flake above my head to the left; surely I was saved. And with a burst of adrenaline to energize my final effort to live, I placed a small Friend in the perfect crack. Before clipping, I pulled on the piece, and nearly fell when the piece pulled out easily. The flake was wobbly and would not hold gear. I was down to my last chance. I was tempted to pull on the loose flake, trusting to luck that it would hold just long enough. But, I could not bring myself to risk it breaking off and sending me tumbling. 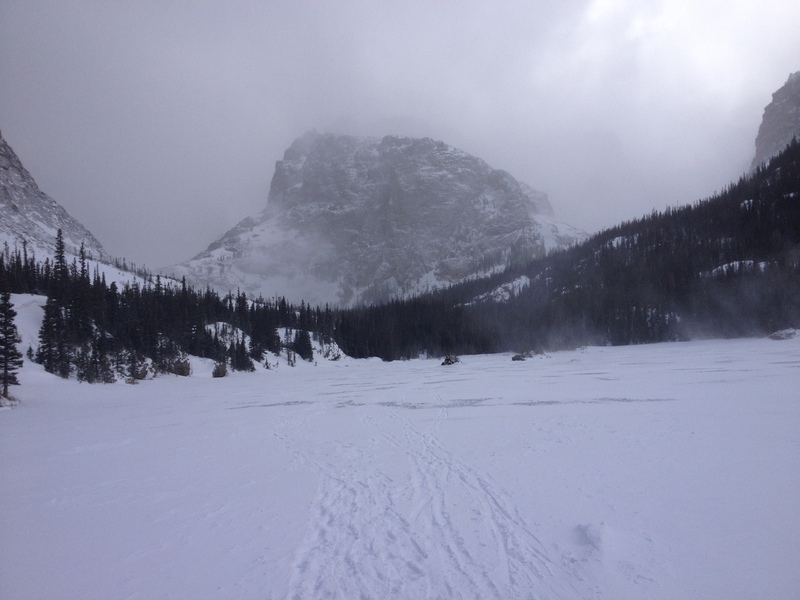 Out of options, I stepped up onto the ice and reached high, above the big boulder and found a hole in which I jammed my now bleeding and numb hand. It was solid. I stepped up with my second foot and then both feet blew out, slipping out from under me on the ice. But the hand jam held and I was able to haul my body higher to reach better holds and my escape. I called back to Brian and apologized for forcing him to follow my terrible path in order to clear the gear. 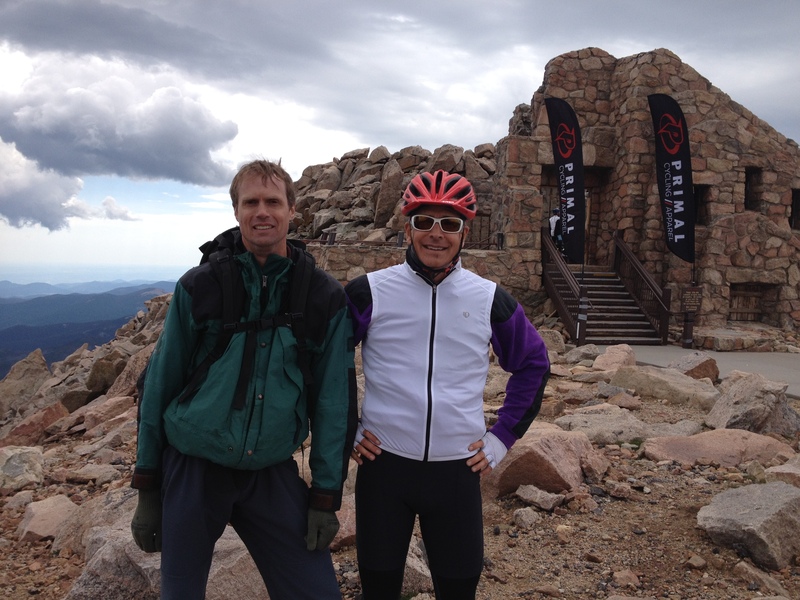 A short time later I reached the top of the 1st pitch and brought Brian up. It took him 10 minutes to climb the pitch that I had agonized on for 45 minutes. 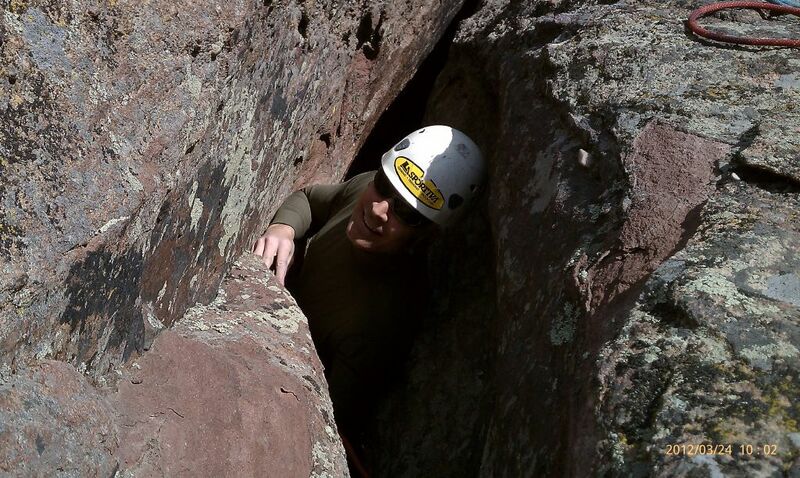 Brian took the 2nd pitch with a promise to check out the fun possibility of escaping from the back of the shallow cave along the way. 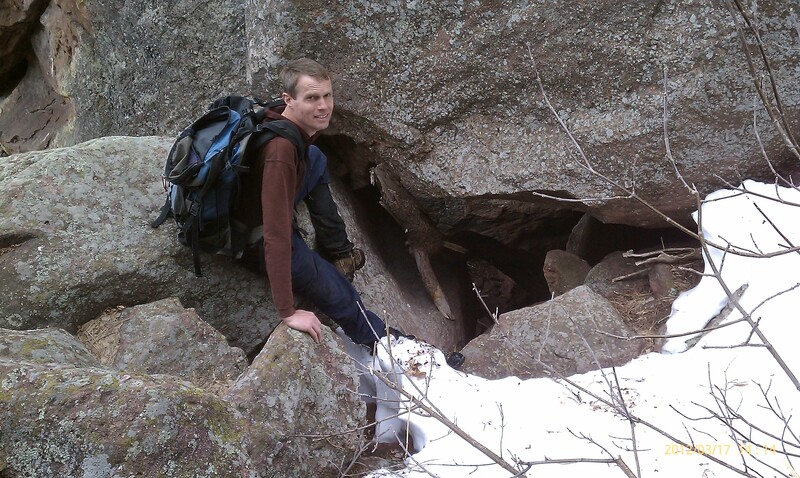 The cave route would only work without packs in Brian’s judgement, and so would have to wait for another day. 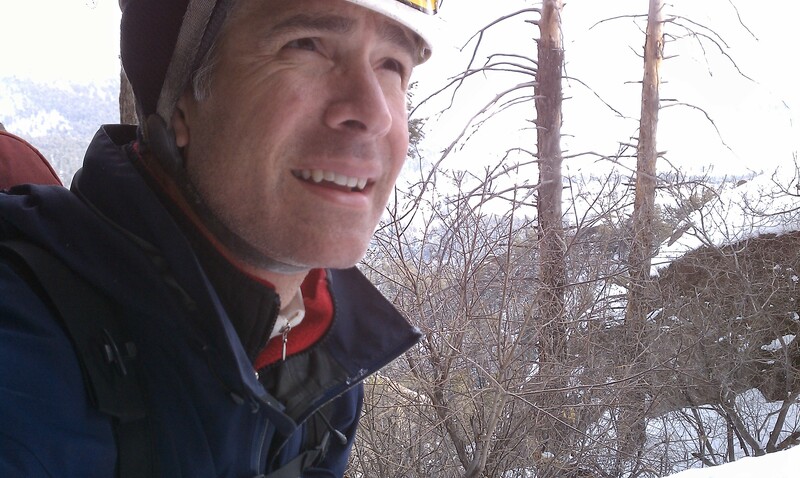 When Brian reached the 2nd belay, he yelled down to see if I had both cordalettes. I announced that I had none (I had given no thought to the matter since I was used to not having one in recent days). Brian then announced that both cordalettes were down at the base. In order to avoid losing both of our cordalettes, Brian untied from one of our double ropes so I could pull it down. I then untied from the rope Brian retained and used the 2nd rope to setup a rappel that I used to return to the base of the climb. I found the cordelettes hanging on a tree near where the gear was hanging when Brian handed it to me 1.5 hours earlier. I should have taken at least one of the cordalettes at that time, but it was that sort of day. 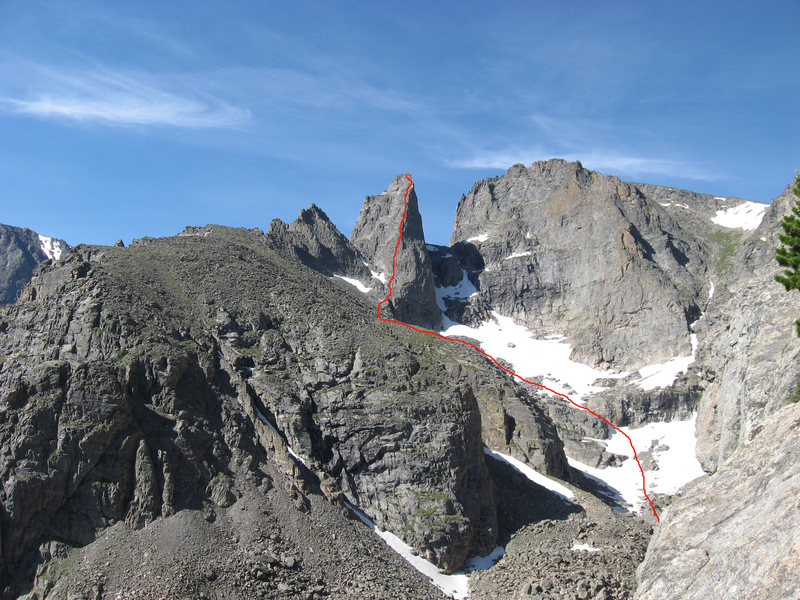 I grabbed them both and then used the rappel rope to batman my way back up, this time using the proper path…snow patch be damned. 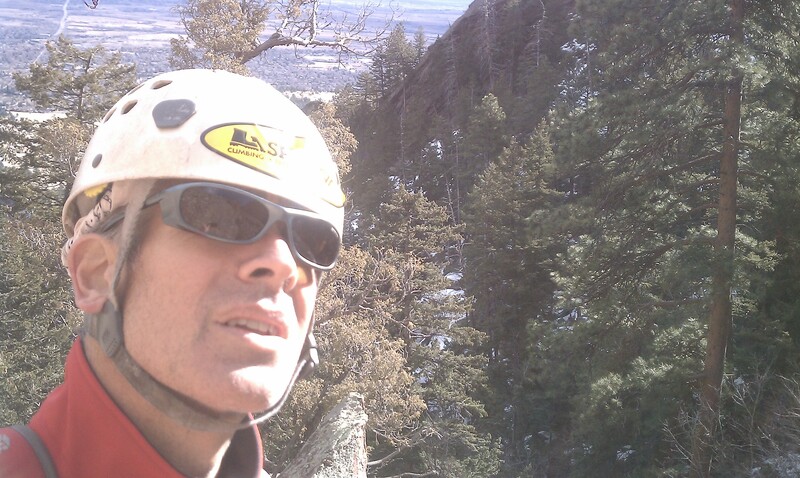 When I got back to the 1st belay, it was 11am. I put the rope away and tied back into the rope anchored to Brian. 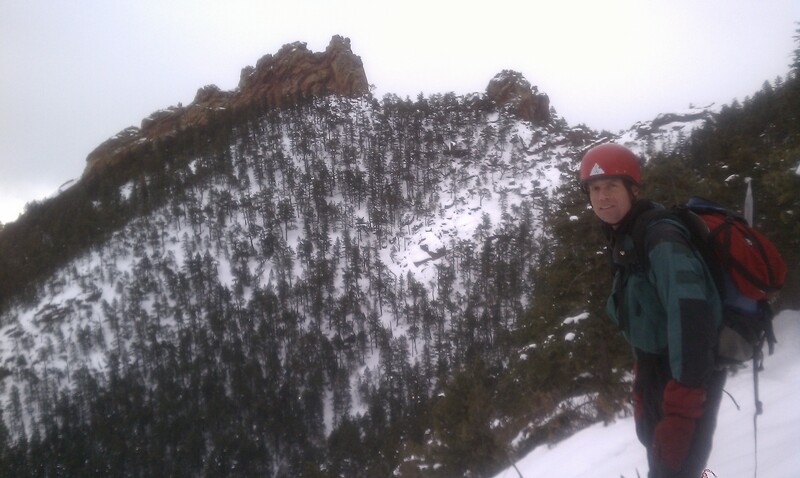 I then followed the pitch quickly to join Brian at the 2nd belay. I was my turn, and I needed to shake off the lack of confidence that hung on me like a bad smell. 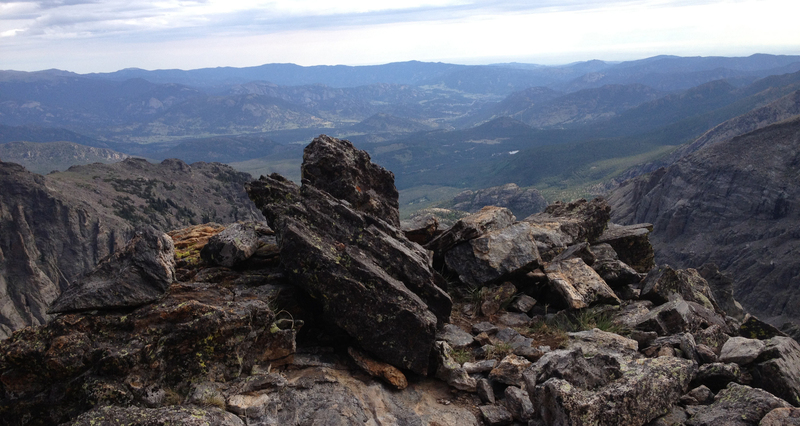 I mostly followed the ridge line as I worked up and right. I managed to not be too stressed despite not finding much gear. 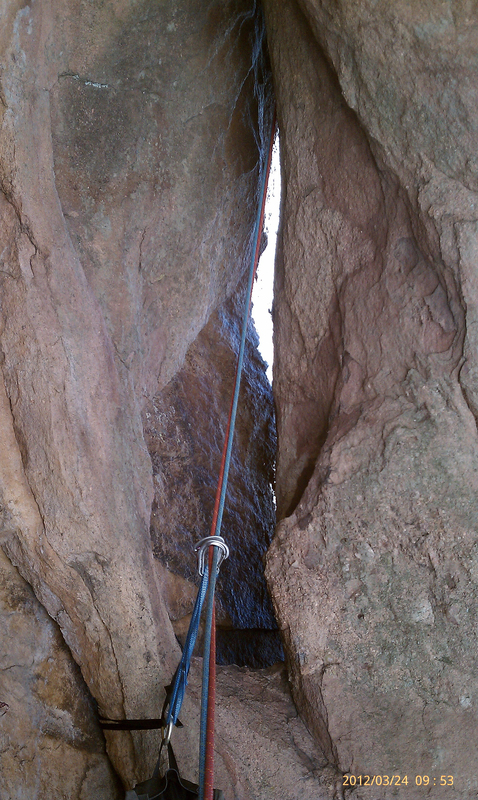 I reached the normal belay spot in a small alcove that separates the upper two pieces of the 1st section of the 4th Flatiron. Brian followed quickly. Brian didn’t think he could reach the end of the 1st section of the 4th Flatiron and enquired about the possibility of a simulclimb. I told him that I had not felt secure all day in my approach shoes and not to push it. As a result, Brian stopped on a good ledge with a nice big puddle. I followed without incident. 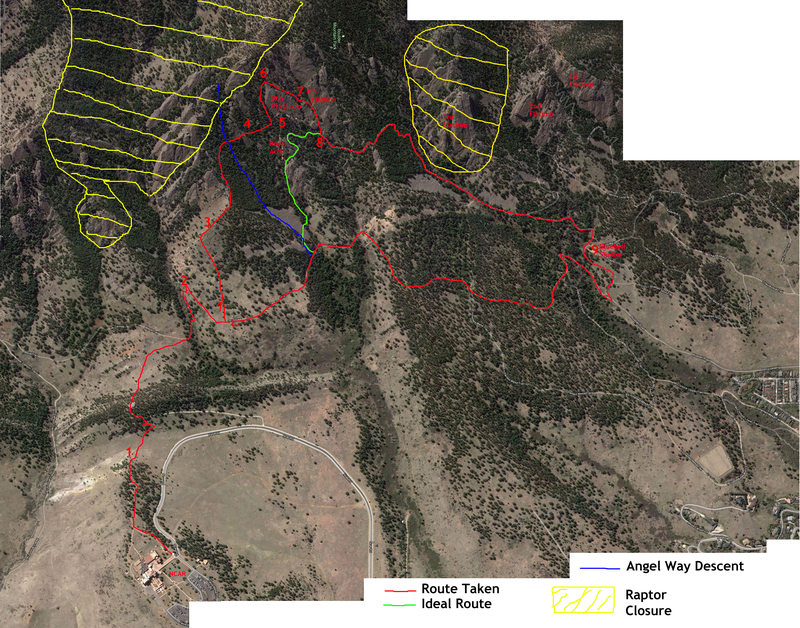 I finished the last bit of the 1st section with a short sprint to the top and then a downclimb to the dirt and rocks between the 1st and 2nd sections of the 4th Flatiron. Brian followed and then agreed to take a break for a late lunch. Afterward, we speculated about where the 2nd section started. We’d done the 4th several times over the years, but the memory wasn’t clear. Several place looked right, but I thought we had to scramble up a ways to get to a ledge system that I saw from the top of the 1st section. But after wandering around for 10 minutes, it finally dawned on me that the proper spot was only a few feet from where we ate lunch. Since it was my poor memory that resulted in us not being sure about the start, it was rightfully my risk to check it out. But Brian was chomping at the bit and grabbed the sharp end. It was his turn, after all. Brian took off and I fed out the rope until it was gone. 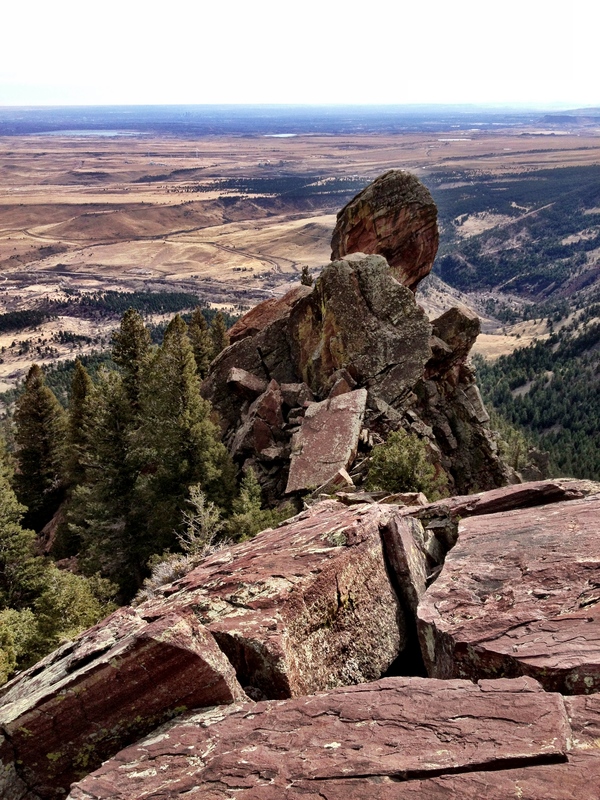 I knew something must have gone wrong…we hadn’t simul-climbed here before. But I hurried to ready myself to give Brian more rope and was ready just as Brian yelled out for more rope. I started the traverse with the knowledge that I must not fall. The trench really didn’t seem wet at first. Flaring, and deep enough to isolate climbers, it was dry except for the few slimy inches of parallel off-width in the center that normally would be the best feet. Still, I thought I that with the low angle, I could stem across the flare on slopers while pinching the edges. There was a little snow up above at the first chockstone, but surely it would be drier after that. But it wasn’t. The chockstone made a platform ideal for holding snow, and soon I was trying to jam soggy shoes, wishing the pro placements weren’t 15-20 feet apart. 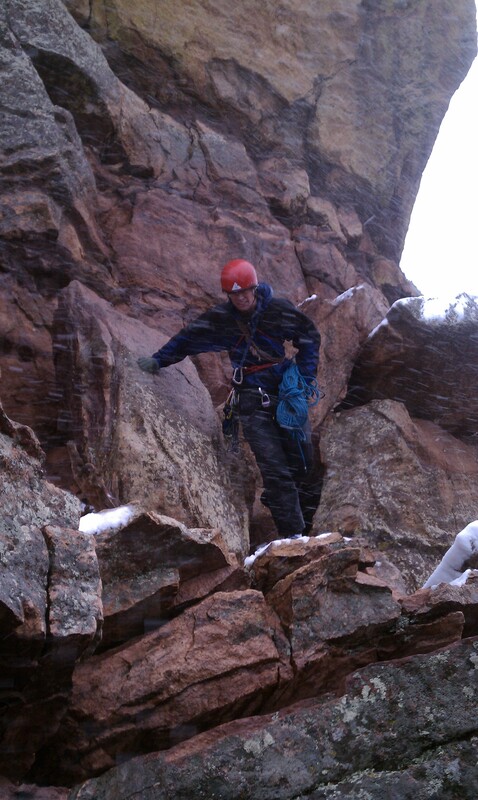 I started looking for a belay perch, figuring that Joe would soon be simul-climbing in the wet stuff. More snow patches came and went with no relief. A lone scrawny tree passed by. 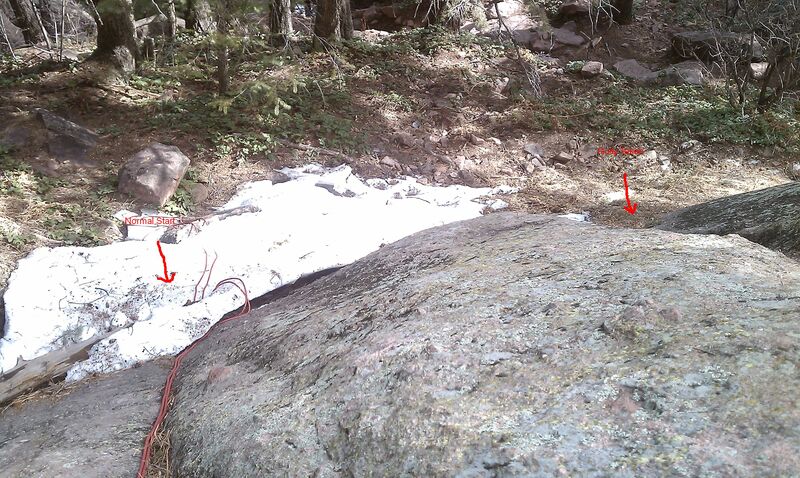 It had no backup and gave no hope that a belayer might keep the rope dry. 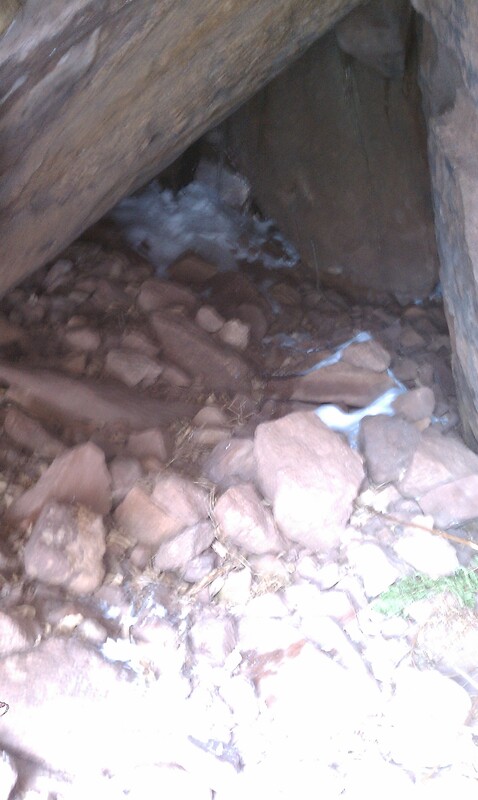 I reached the base of the crux section, got in a good cam, and knew that Joe must be standing in slime. I was standing in postholes. Another 8 feet of rock and I was actually sliding, just breaking even between forward and backward movement. I could back off to the last cam, but then what? Ask Joe to lead in his approach shoes with no pro until the next chockstone? I leaned a shoulder into the flaring groove and stretched the opposite foot way out to some holds, then chimneyed and groveled my way for 15 dripping feet, hollering for rope slack. That got me to the last chockstone where the grade eased up and the snow reappeared. A dry, side-sloping ramp on the left was the final remaining section of the 4th’s middle tier. It promised some cam placements, but it was all lies. Its dry nature wilted under my wet feet. When I finally sunk my fingers around a lip that formed a threshold to the hanging garden, I was beat and extremely thankful that Joe had remembered the classic climber’s mantra: “the belayer must not fall”. Back at the bottom of the pitch on simul-climb, I found at first that the climbing was no big deal; the traverse was barely technical. Once I dropped into the gully, the situation became more interesting. I made every effort to keep my approach shoes out of the snow and water; I didn’t want a slip. 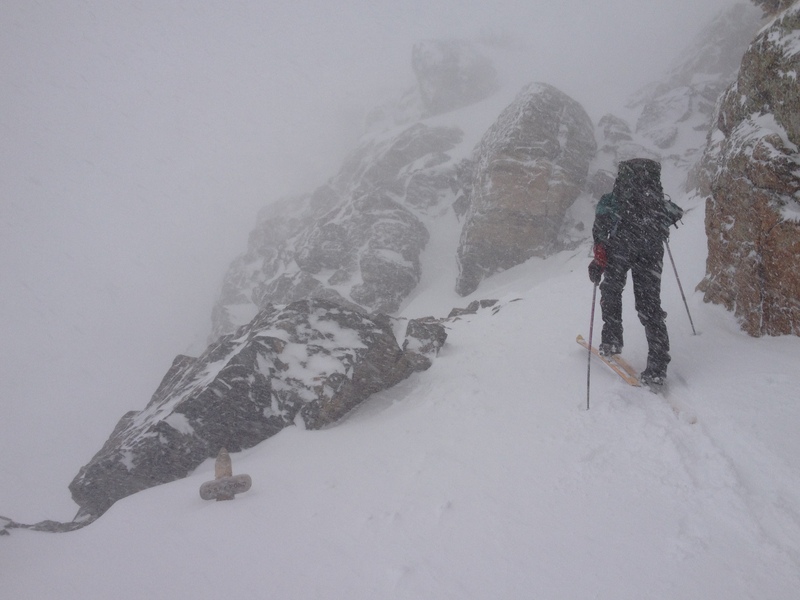 Fortunately, once the conditions deteriorated to the point of ridiculousness, I could see Brian had setup a secure belay; a slip would no longer mean a permanent end to the Brian and Joe show. 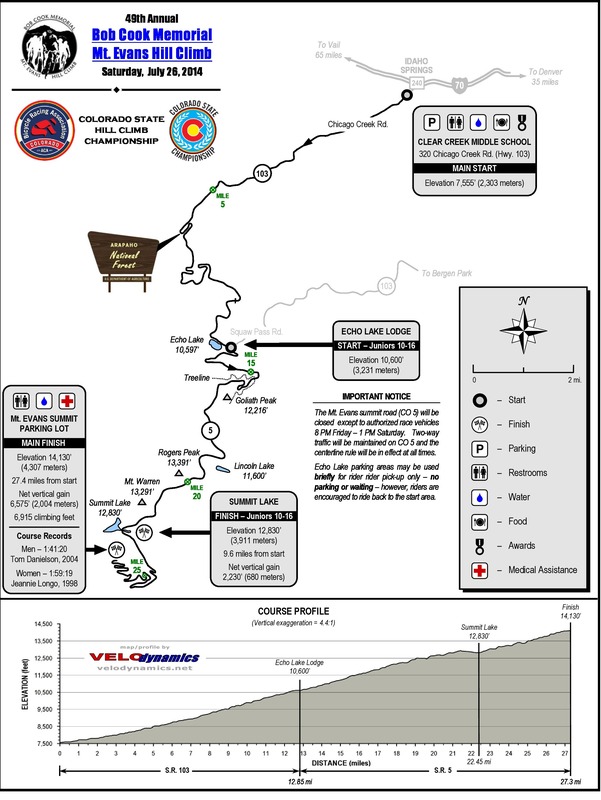 The last section was so slippery I said out loud to Brian, “well, this couldn’t have been fun on simul-climb.” Brian merely grunted in agreement. Once in the Hanging Garden, it was clear we were done. We only had 3 hours of light remaining to do 4 more pitches plus a long slog to the summit of Green Mountain and a 30 minute descent. No way. We’ve been down that path on this exact rock before; we wouldn’t do it again. It just wasn’t our day. The descent was nasty but at least non death-defying. I was glad to be alive. I’ll do better. I promise. And I think I’ll be bring my rock shoes when I go rock climbing from now on.